A young man is leaving for work on the first day of his career as a police officer. His mother reminds him of his late policeman father’s dictum: “There are three paths in life – the right path, the wrong path and the middle path.” To this he, Sub Inspector Adi Kulshreshtha, adds: “…and the day I find my own path, I will have peace of mind.” He remembers too Dad’s cautionary note that the choice will not be easy. Adi faces one such moral dilemma early on. On a rainy night in the skinny bylanes of a Mumbai slum cluster, he is chasing a murder suspect when they confront each other at a dead end. Many stories have already been told about forks in the road and the what-ifs that might unfold (or might have unfolded) depending on the turn you take. The enjoyment in watching director Amit Kumar’s Monsoon Shootout comes from the fact that he does not just lay out a series of ethical, unethical and gray-area options before us to create suspense, but that in painting each possible scenario, he also raises multiple questions about our motivations for going with one or the other. Do you, for instance, pick the right, wrong or middle path based on the dictates of your conscience or based on the rewards you expect to reap from your actions? If all three paths cause you the same suffering or bear the same fruit, would you bother with the one you deem right? As the audience and hero grapple with these quandaries, Monsoon Shootout becomes an interesting combination of suspense thriller and modern morality tale. Kumar’s film has been in the public eye for several years now. It was premiered at Cannes in 2013 and – oddly, considering the commercial potential of the material and a marquee name like Anurag Kashyap among its producers – has taken four years to come to mainstream theatres in India. Thankfully, it is none the worse for the wear. Monsoon Shootout’s on-point casting is one of its victories. Vijay Varma provides ample proof of his chameleon-like abilities by metamorphosing into an innocent youngster with carefully calibrated reactions who is just feeling his way around life, in sharp contrast to the worldly wise, repugnant predator he played in Pink last year or the hero’s combustible friend Pakiya in the lesser known Rangrezz. The questions confronting Adi are fascinating, but the character itself is somewhat bland. That cannot be said of the alleged axe murderer Shiva (Nawazuddin Siddiqui) and Adi’s boss Khan (Neeraj Kabi) who remain attractively mysterious at all times. Siddiqui manages to make Shiva marginally less or more menacing without any evident effort in each of the four alternative episodes narrated in the film. In many of his earlier works, he has summoned up that trademark mischievous look in his eyes to give evil or irreverent characters an edge. Here that alluring glint is gone. There is no smile to charm us, just a hardness that softens microscopically with each telling. By not trying to be either likeable or repulsive to us, Kabi – who was simply electric as a priest in Ship of Theseus – ensures that with each version of Adi’s tale, we begin to understand Khan just that little bit more. Not like or dislike him, but understand what makes him tick. Adi’s doctor friend Anu played by the very striking Geetanjali Thapa (National Award winner for Liar’s Dice, credited here as only Geetanjali) left me asking for more from the writing though. The nature of this film is such that no character gets the in-depth treatment meted out to Adi, which is fair enough, but Anu is the only central character who feels superficial. In fact, all the women in Monsoon Shootout operate on the sidelines of Adi’s existence. Their actions barely impact the main premise of this story, unlike the men whose life choices are crucial to Adi’s decisions and who decisively take centrestage at points in the narrative. Geetanjali manages to be memorable despite her rather vanilla role. 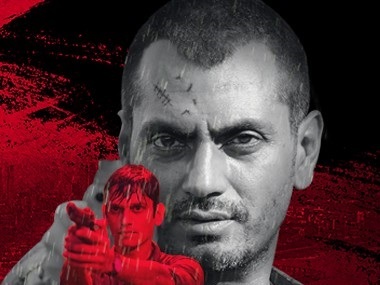 Monsoon Shootout is filled to the brim with action and feels appropriately trim at barely 1.5 hours running time. Rajeev Ravi’s intimate, low-lit frames and the background score by Atif Afzal and Gingger Shankar add to the film’s intensity, with the camera offering us a persistent blast of light and space in only two scenes: a murder in the beginning and a fake encounter. Considering its setting, it is natural that the film is steeped in violence yet at no point is it in-your-face gratuitously bloody. Atanu Mukherjee and Ewa Lind’s editing complements Amit Kumar’s smart writing such that though I occasionally needed to mentally retrace my steps through the narrative to recall when one version of Adi’s what-if ended and the next began, far from being confusing the effort added to the level of involvement in Monsoon Shootout. In the past couple of decades, too many Hindi gangster films have smacked of a desire to impress with coolth, a desire to be ‘international’ (read: draw from the gangs of Martin Scorcese and Quentin Tarantino) or to borrow Ram Gopal Varma and Anurag Kashyap’s voices. Amit Kumar may well be inspired by these gentlemen, but his storytelling style in Monsoon Shootout reveals a rootedness in his own individuality. He particularly distinguishes his adventure from Varma and Kashyap’s filmography by not dipping too much into the specifics of a local cultural milieu and lingo and by not opting for highly stylised stunt choreography, but staying unwaveringly focused instead on Adi’s moral dilemma. Four years has been an unfairly long wait for mainstream Indian theatre-goers, but our reward is a nicely engaging film with several morally compelling questions at its core. Up Next: Will The Key Ingredient Of Rajamouli Movies Be Missed In Jr NTR-Ram Charan Movie?